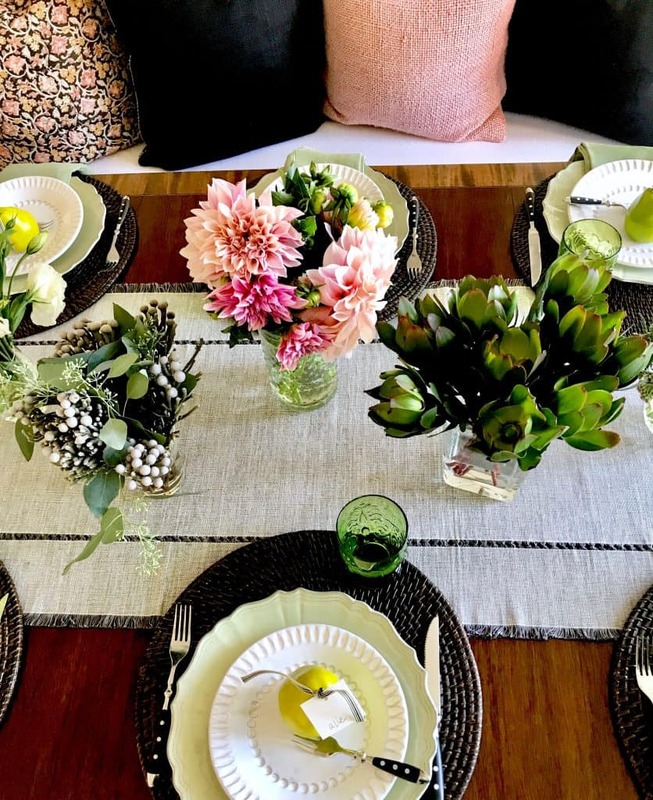 Welcome to another Project Design, where we tackle relatively easy décor projects along with a small group design bloggers! Annie from Most Lovely Things is joining Cindy from Rough Luxe and me on a regular basis from here on out (yay, Annie! ), about once a month. 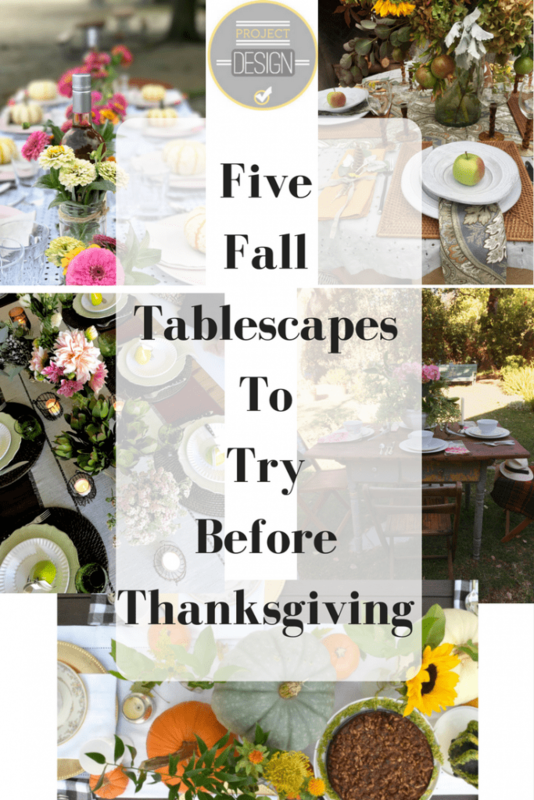 At the end of the post, see the other fine bloggers who are participating with us for Five Fall Tablescapes to Try Before Thanksgiving. Do you have several mismatched glass vases like I do? 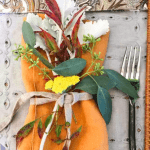 Well, they inspired this Fall tablescape. Each different vase is holding a different flower bouquet. Which also make nice party favors to send home with your guests. It’s fun to switch out my pillows on our WS Home dining bench. (In fact, I like to sit here with my laptop and write a blog post or two…when it’s not all set up like this). 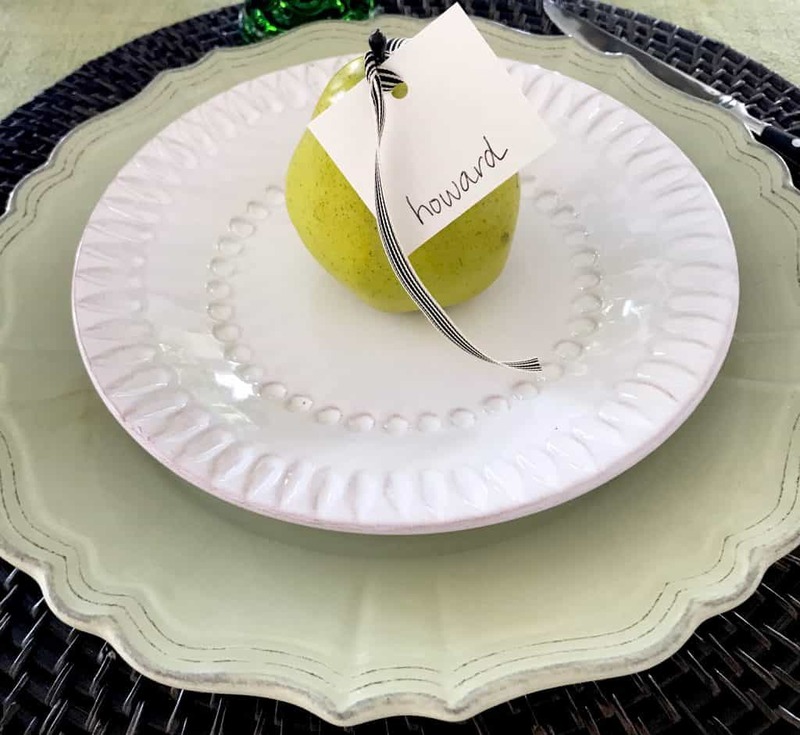 I put name tags on faux pears using black striped ribbon. The green plates are from Homegoods (from a few years ago). 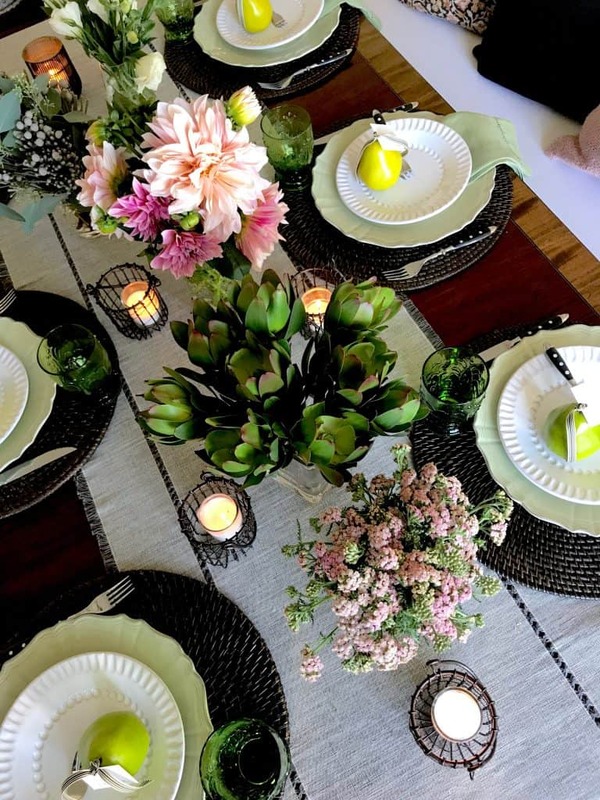 My gray oversized runner can be used year round with these dark rattan placemats and green linen napkins. Pottery Barn candles (my favorite–they are in glass and come in a set of 16) are in little iron wire votives from Save on Crafts. 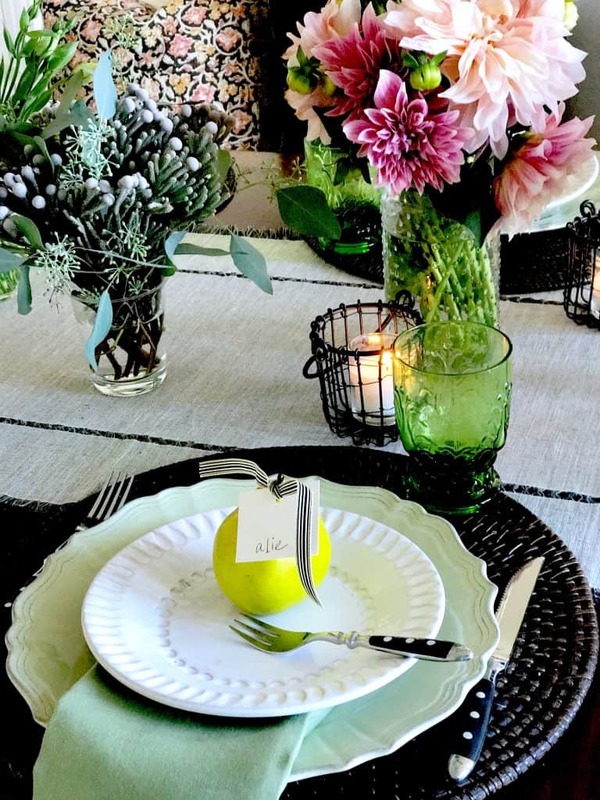 My previous post has a couple of recipes that go well with this table setting…like a Tasty Autumn Pear Salad. Now I can’t wait to see what these creative ladies have done! Love all the pretty flowers and especially pink touches. Gorgeous. Thanks, Brooke… I have always loved pink. Off to see what you have done!!! How charming to give your guests a bouquet to take home! That’s a wonderful idea. I love your tablescape in the fresh outdoors, Janet. This is so gorgeous! 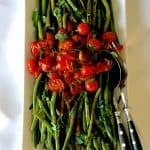 You are the tablescape master! You really do pink right!! Do I spy some new pillows in the background? 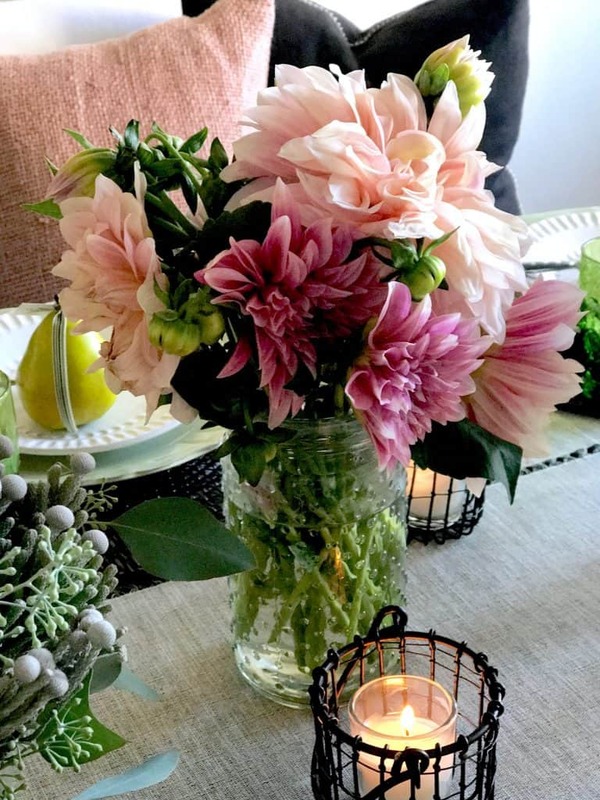 Those dahlias are to die for! I hope you got to enjoy them for awhile! Loved all the ladies tablescapes they were fab! Yes…one new pink pillow, Cindy. Off to see what you all did with your tables! 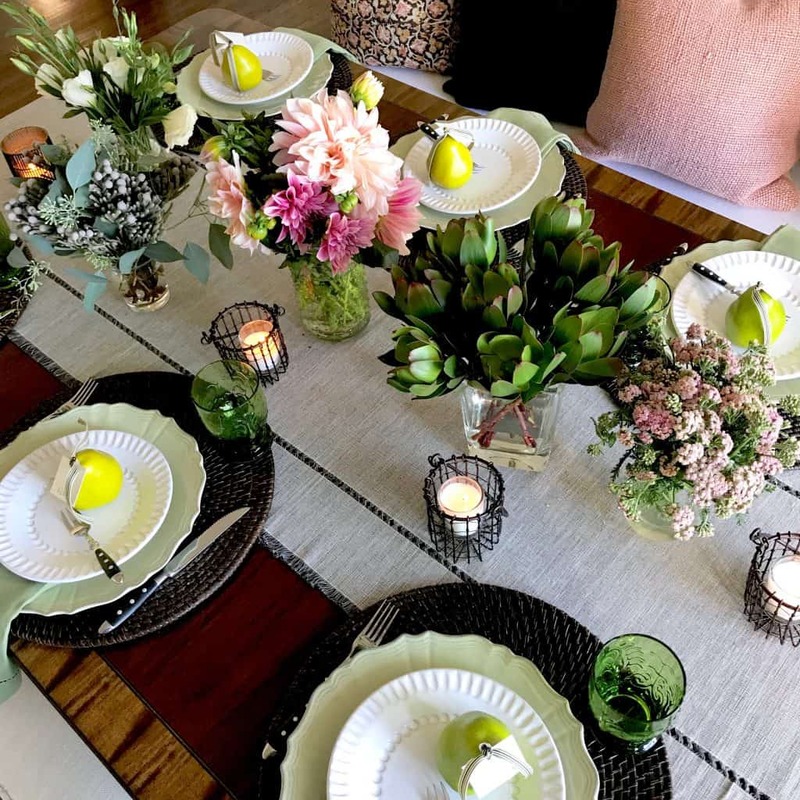 I always think one of the most fun parts about entertaining is setting the table and arranging flowers, candles and some sort of theme, it is one thing I hate to rush, it really does set the mood and makes all the difference. Your tablescapes are beautiful. Me too, Susan! And I prefer to let my husband cook…he likes it. I usually do the appetizers and dessert though. So very, very pretty! Love the colors! Thanks for the resources. What a cheerful table setting!! This is great and super fun. Thanks! loving the contrast and juicy, delicious colors! I would feel honored to be invited to your beautiful table, Mary ann. Bravo! 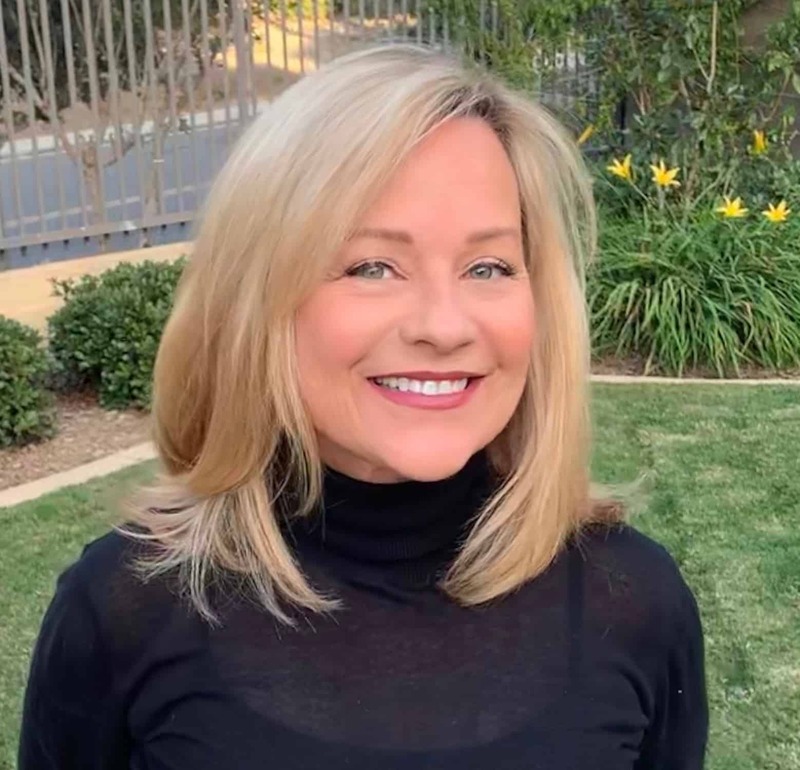 I would be honored to have you at my table, Michele!! I adore your table and all the flowers. How creative to use all different flowers in each vase. 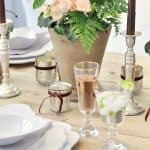 And the votive candle holders, green glassware and pears as placecards add touches of warmth and creativity. Absolutely gorgeous! I would love to sit at any of these beauTiful tables. Each one with its own style and each one perfect for the changing season. 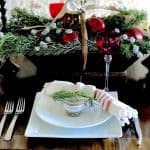 Thank you for the inspiration and Reminding me that with a little thought and preparation my holiday table can be Beautiful too. Thanks, Gail…you are always SO kind! 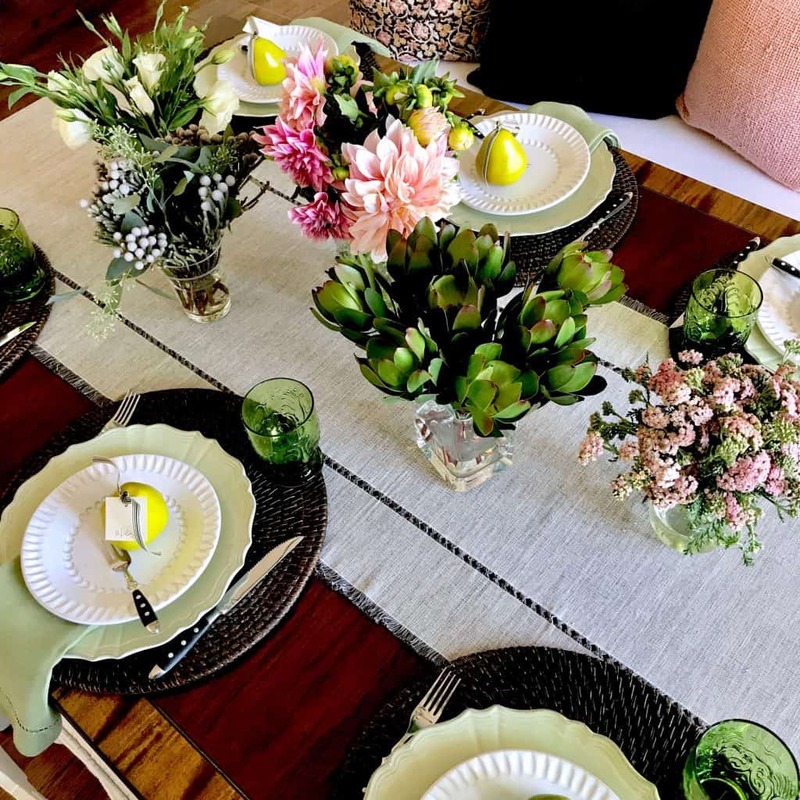 I love what you did with your table Mary Ann, the little vases of different flowers is so pretty and I love the idea of giving them to your guests to take home. Thinking about your home state and all the devastation this week.Hope you and your loved ones are all safe and sound. Thanks, Lisa. I feel so sorry for all the firefighters and displaced families. Just smoky here…so a constant reminder.